We offer evening classes on Mondays, Tuesdays, Wednesdays, Thursdays, and Fridays, and morning classes on Tuesdays, and Sundays that are suitable for newcomers. Our lunchtime meditations and after-work meditations are only a half-hour long and a great way to get a taste of meditation. We also have monthly introductory classes, Awakening the Heart and How to Meditate, as well as regular day and weekend meditation courses and retreats. Please contact us if these FAQs do not answer your question. No. Anyone can learn basic meditation and experience the benefits. Buddhism is a non-evangelical religion. Buddhists respect all people and are happy to help anyone regardless of whether they subscribe to another faith or to none. No. All you need is the wish to improve yourself and the quality of your life. What relevance does Buddhism have to the US now and to my life? Although Buddhism first appeared in India over two and a half thousand years ago, it has a timeless and universal relevance. In a nutshell, Buddha explained that all our problems arise from confused and negative states of mind. He taught methods for ridding the mind of these destructive states and thereby realizing true happiness and fulfillment. These methods work for any mind, in any country, at any age. Buddhists regard all Buddhas and Bodhisattvas as perfect guides and role models, and as such, naturally develop faith in them and rely upon them as Spiritual Guides. For this reason, Buddhists strive, through meditation, prayer, and various ritual practices, to connect with enlightened beings and receive their transforming blessings. Is the Zen Temple LV part of Tibetan Buddhism? With the hectic pace and demands of modern life, many people feel stressed and over-worked. It often feels like there is just not enough time in the day to get everything done. Our stress and tiredness make us unhappy, impatient and frustrated. It can even affect our health. We are often so busy we feel there is no time to stop and meditate! But meditation actually gives you more time by making your mind calmer and more focused. A simple ten or fifteen minute breathing meditation as explained below can help you to overcome your stress and find some inner peace and balance. Meditation can also help us to understand our own mind. We can learn how to transform our mind from negative to positive, from disturbed to peaceful, from unhappy to happy. Overcoming negative minds and cultivating constructive thoughts is the purpose of the transforming meditations found in the Buddhist tradition. This is a profound spiritual practice you can enjoy throughout the day, not just while seated in meditation. 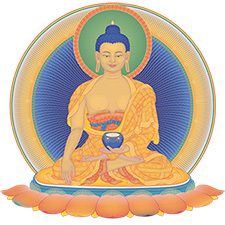 On this website you can learn the basics of Buddhist meditation. A few books are mentioned that will help you to deepen your understanding if you wish to explore further. Anyone can benefit from the meditations given here, Buddhist or not. We hope that you find this website useful and that you learn to enjoy the inner peace that comes from meditation. If we want to cultivate external crops we begin by making careful preparations. First, we remove from the soil anything that might obstruct their growth, such as stones and weeds. Second, we enrich the soil with compost or fertilizer to give it the strength to sustain growth. Third, we provide warm, moist conditions to enable the seeds to germinate and the plants to grow. purifying negativity, accumulating merit, and receiving blessings. In the same way, to cultivate our inner crops of Dharma realizations we must also begin by making careful preparations. First, we must purify our mind to eliminate the negative karma we have accumulated in the past, because if we do not purify this karma it will obstruct the growth of Dharma realizations. Second, we need to give our mind the strength to support the growth of Dharma realizations by accumulating merit. Third, we need to activate and sustain the growth of Dharma realizations by receiving the blessings of the holy beings. by all the Buddhas and Bodhisattvas, like the full moon surrounded by stars. And make offerings both set out and imagined. And rejoice in the virtues of all. And turn the Wheel of Dharma for us. I dedicate all virtues to great enlightenment. May all beings enjoy such Pure Lands. Please accept these and bless me to be released directly from the three poisons. To follow him with great devotion. All day and night to seize its essence. Just like the shadow of a body. To gain the bliss of perfect freedom. The doctrine’s root, the Pratimoksha. Bless me to train in bodhichitta. Of special insight and quiescence. And keep them at the cost of my life. Which are the essence of the Tantras. All obstacles, outer and inner. And gain the state of Vajradhara. To practise in the same way. So that samsara is finally extinguished. The purpose of contemplation is to bring to mind the object of placement meditation. We do this by considering various lines of reasoning, contemplating analogies, and reflecting on the scriptures. It is helpful to memorize the contemplations given in each section so that we can meditate without having to look at the text. The contemplations given here are intended only as guidelines. We should supplement and enrich them with whatever reasons and examples we find helpful. a peaceful mind continuously, throughout our life. When through our contemplations the object appears clearly, we leave our analytical meditation and concentrate on the object single-pointedly. This single-pointed concentration is the third part, the actual meditation. When we first start to meditate, our concentration is poor; we are easily distracted and often lose our object of meditation. Therefore, to begin with we shall probably need to alternate between contemplation and placement meditation many times in each session. For example, if we are meditating on compassion we begin by contemplating the various sufferings experienced by living beings until a strong feeling of compassion arises in our heart. When this feeling arises we meditate on it single-pointedly. If the feeling fades, or if our mind wanders to another object, we should return to analytical meditation to bring the feeling back to mind. When the feeling has been restored we once again leave our analytical meditation and hold the feeling with single-pointed concentration. More detailed instructions on the contemplations and on Lamrim meditation in general can be found in Modern Buddhism and Joyful Path of Good Fortune. Dedication directs the merit produced by our meditation towards the attainment of Buddhahood. If merit is not dedicated it can easily be destroyed by anger. By reciting the dedication prayers sincerely at the end of each meditation session we ensure that the merit we created by meditating is not wasted but acts as a cause for enlightenment. This consists of advice on how to integrate Lamrim meditation into our daily life. It is important to remember that Dharma practice is not confined to our activities during the meditation session; it should permeate our whole life. We should not allow a gulf to develop between our meditation and our daily life, because the success of our meditation depends upon the purity of our conduct outside the meditation session. We should keep a watch over our mind at all times by applying mindfulness, alertness, and conscientiousness; and we should try to abandon whatever bad habits we may have. Deep experience of Dharma is the result of practical training over a long period of time, both in and out of meditation, therefore we should practise steadily and gently, without being in a hurry to see results. To summarize, our mind is like a field. Engaging in the preparatory practices is like preparing the field by removing obstacles caused by past negative actions, making it fertile with merit, and watering it with the blessings of the holy beings. Contemplation and meditation are like sowing good seeds, and dedication and subsequent practice are the methods for ripening our harvest of Dharma realizations. 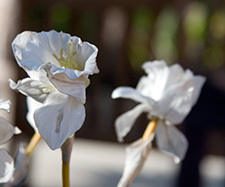 Get your private updates to meditate in the gardens in the Zen Temple in Las Vegas. A Judeo Christian Mission of One Love. Bringing Zen and Love to the Mecca of Nevada.